If migraines are messing with your quality of life, yoga could help by easing pain, calming the mind and nervous system, and relieving tension. Take your pick from forward bends like hastapadasana, janu sirsasana, and paschimottanasana or use classic poses like padmasana, savasana, or balasana to help with your migraines. The blinding pain of a migraine can bring anyone to their knees. In fact, it is the world’s sixth leading cause of years lost due to disability.1 So you’d be forgiven for wanting some way, any way, to rid yourself of the pain and other symptoms that go with this malady. While mainstream medication offers some solutions, yoga may be an alternative way to migraine relief. Not only will regular practice of yoga help, but specific asanas or poses can also be more beneficial than others when it comes to addressing the specific symptoms or pain linked to headaches and migraines. Here are some of those that have such benefits. The lotus pose helps relax your mind and can ease a headache.5 It can also ease muscular tension. Sit on the ground on a mat with your legs stretched ahead of you, your spine erect. Bend your right leg at the knee, placing that leg onto your left thigh so that the soles of your feet point up and your heel is as close to your abdomen as you can manage. Bend your left leg at the knee, bringing it onto your right thigh in the same manner. Now put your hands into a mudra of your choice. Try the classic chin mudra, where you bring the index finger and thumb together to form a circle, touching them together lightly and extend the rest of your fingers straight. Ensure your spine is erect throughout. Inhale and exhale deeply with long breaths. Stand straight, arms by your sides, feet together. Keep your weight balanced on both feet. Inhale as you extend your arms over your head. Exhale as you bend forward and down to your feet, arms extended. Your hands should rest on the floor, next to your feet or on your legs. Try and bring your chest closer to your knees and raise the hips as well as tailbone higher each time you exhale. Your head must remain relaxed and move gently to your feet. Hold this position for a few seconds. Build up to 20–30 seconds over time. Breathe in and out as you do so. Inhale, stretching your arms forward and then up as you return to standing. Exhale, bringing your arms down to your sides. Sit down on a mat with your legs together and extended in front of you, your spine straight, hands resting lightly on the mat near your upper thighs. Bend one knee to your chest while the other remains extended. Let the bent leg drop to the side. The foot of this leg should graze the inner thigh of the straight leg. Place your arms behind your back and as you exhale, use them to raise your spine upward. Your shoulders mustn’t rise up. Now place the hands on the foot (or ankle or knees, whichever you can reach) of the straight leg. Exhale, moving your pelvis forward so the spine can move up a little too. Your straight leg can curve in slightly but should remain straight. Do not bring your head to the knee as this will cause your back to arch. Get the length from your spine and gently ease forward. Hold for a few breaths. Build on how long you hold over time. Come up slowly and repeat to the other side. Sit on the ground on a mat or folded blanket to support the buttocks, with your legs extended in front. Rock on each buttock by turn, pulling away from the other sitting bone as you do so. The tops of your thighs must be turned in ever so slightly and pressed into the floor. Also, press your palms and fingertips into the floor and raise your sternum up to the ceiling. Breathe in as you lean forward from your hip, arms fully extended, elbows straight, hands on the sides of your feet, and your thumbs resting on your soles. Do not lean from your waist. Feel your tailbone lengthen. If you cannot reach your feet with the hands, use a strap looped around the feet and hold this instead. Gently ease into the forward bend, lengthening your torso and keeping the head raised. Your elbows must bend out to your sides and lift up off the floor. If you are holding a strap, then loosen your hold, move your hands forward and keep your arms long when you do this. Feel your lower belly graze your thighs, followed by your upper belly, and then your ribs. Your head will touch your thighs last. Allow your front torso to rise and lengthen a little each time you breathe in. When you exhale, release more into the forward bend. Repeat this for 1–3 minutes. To exit the pose, lift your torso from your thighs gently and straighten your elbows. Breathe in as you raise your torso up, pulling your tailbone into the pelvis. If you are trying to ease pain and tension from the front of your head, this asana can help.14 It calms the nervous system and frees the brain of stress, leaving you feeling relaxed. Get hold of a stable chair and some blankets. Fold the blankets so the rounded edge is near the legs of the chair. Now lie down so your head is below the chair and shoulders on the blankets. Bend your knees to your chest and then raise your thighs up over your head so they rest fully on the chair. Bend your arms by your sides at right angles to your torso so the fingers are pointing up in the same direction your toes are pointing (away from the torso). Let your body relax in this position. Exit the pose by bringing your arms back to your sides and then gently and slowly lower your legs in a controlled manner. If you are tall, you may need to place extra blankets on the chair itself to help your spine extend fully. Sit comfortably on the floor or on a comfortable surface. Firm your shoulder blades against your back to allow your sternum to be lifted. Your ribs in the front of your torso must not jut out. Your chin must rest comfortably on your sternum, with both the chin and the elevated sternum meeting midway between the two. Take care not to only lower your chin all the way without elevating the sternum. The bottom of your chin and front of your neck meet at the “crook.” Draw this up diagonally toward the top of your spine and into your skull. To do this, your chin should lower and your head may pivot, drawing the top of the sternum up. Start inhaling when your head is upright and apply this chin lock toward the end of the inhalation. Hold this lock as you retain the breath. When you exhale, raise your head back to a neutral position until you inhale again. Lie on your back with knees bent so that your feet are firmly flat on the floor about hip-distance apart. Reach toward your heels with your fingers, lengthening your arms. Your palms must face down. Let your gaze drop down to your knees. Breathe in as you roll your body up through the spine beginning with your hips. Go as high as you can. Hold this pose for 3–5 breaths before exhaling and lowering your body slowly (feel one vertebra lower at a time). Go down on your hands and knees. Ensure your knees are below your hips and hands below but a little ahead of your shoulders. Breathe in, spreading your fingers wide, keeping your palms firmly on the floor and tucking your toes under. Breathe out, extending your legs and drawing your tailbone and hips up toward the ceiling. Your body should make an inverted V shape. Ensure your neck and head are between your upper arms and your feet hip-distance apart. Keep your spine lengthened throughout, releasing your shoulders away from your ears. You should let your knees bend as needed to maintain the pose. Just take care that both your hands and your feet are properly rooted. Hold. 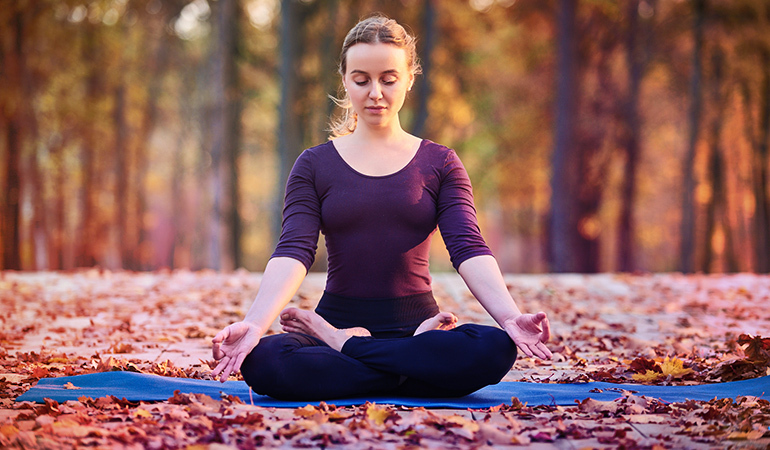 Inhale and exhale 3–5 times before releasing the pose. Kneel down keeping knees hip-width apart. Let your big toes touch as you rest on your heels. Leave your hands, palms facing up, on either side of your torso. Inhale as you raise your arms upward. Exhale as you bring them down, ending with them resting in front of your body, your eyes lingering on the floor. Do this inhalation and exhalation movement five times. Lie down on your back, flat on a mat or the ground, arms by your sides, eyes closed. Your legs must be a little apart so that you are completely comfortable and toes facing a little outward. Allow your knees and feet to relax fully. Your arms should be by the sides and a little away from your torso. Your palms must face up and be open. Focus your attention on one part of the body at a time and use this to relax your body from head to toe. Start with your right foot, then the right knee, the other leg, then the torso until you reach your head. Inhale slowly, deeply, and gently. Feel your breath relax you further and further. As you inhale, feel the breath energize you. As you exhale, feel yourself relax. Do this for 10–20 minutes until you are completely relaxed – but not asleep! To exit the pose, roll to your right side with your eyes still closed. Be this way for a minute. Then, using your right hand to push yourself up, move to a seated position. Let your eyes remain closed. Breathe in and out a few times in this pose before you open your eyes. With this set of asanas, you should be able to see some of your migraine symptoms easing or, at the very least, be able to help reduce some associated problems like tension or fatigue. Get the help of a trained yoga practitioner to oversee the asanas at first, to ensure you are doing them right. And remember, the yoga therapy is a great addition to your treatment for migraines, but do not go off medication without first consulting your doctor, especially if your symptoms are severe. 1, 4. ↑ Migraine and Aura. American Migraine Foundation. 2. ↑ Kisan, Ravikiran, M. U. Sujan, Meghana Adoor, Raghavendra Rao, A. Nalini, Bindu M. Kutty, BT Chindanda Murthy, T. R. Raju, and T. N. Sathyaprabha. “Effect of Yoga on migraine: A comprehensive study using clinical profile and cardiac autonomic functions.” International journal of yoga 7, no. 2 (2014): 126. 3. ↑ John, P. J., Neha Sharma, Chandra M. Sharma, and Arvind Kankane. “Effectiveness of yoga therapy in the treatment of migraine without aura: a randomized controlled trial.” Headache: The Journal of Head and Face Pain 47, no. 5 (2007): 654-661. 5, 7, 19, 22, 25, 28. ↑ Yoga to cure migraine and headache. The Art of Living. 6. ↑ Padmasana-Lotus Position- Steps and Benefits. The Art Of Living. 8. ↑ Standing Forward Bend (Hastapadasana). The Art of Living. 9, 11, 17. ↑ Ask the expert. Yoga Journal Aug 2007. 10. ↑ Janu Sirsasana. Yoga Journal Mar 1982. 12. ↑ Yoga to cure migraine and headache. The Art of Living. 13. ↑ Seated Forward Bend. Yoga Journal. 14, 20. ↑ Ask the expert. Yoga Journal Aug 2007. 15. ↑ Asanas To Relieve Depression. Yoga Journal. 16. ↑ Yoga Cure for Headaches. Yoga Journal Jan-Feb 1999. 18. ↑ Net bearer bond. Yoga Journal. 21. ↑ 10-minute Foundational Yoga Routine. American Council on Exercise. 23. ↑ Downward-Facing Dog. Yoga Journal. 24. ↑ A Beginner’s Guide to Yoga: 5 Widely Practiced Poses. American Council on Exercise. 26. ↑ Yoga for Neck Pain. Yoga Journal. 27. ↑ Mueller, Donna. “Yoga Therapy.” ACSM’s Health & Fitness Journal 6, no. 1 (2002): 18-hyhen. 29. ↑ Savasana – Corpse Pose. The Art of Living.